-Decent size for a wing prospect at 6'6 205 lbs. Strong frame. -Competitive, aggressive player on both ends of the floor. Makes an effort to sit down and defend. Will get on the floor for loose balls. High motor overall. -Capable spot shooter with time and space. Can shoot on the move a little bit. Decent rise shooting in mid-range spots off screens. Can make a one-dribble pull up. -Solid straight line driver vs hard closeouts or when run off the line. More powerful than explosive, but uses his size to finish above the rim in space at times. -Has potential as a passer. Willing to play a role. - Uses his strength on the defensive end. Doesn't have elite size or length for a wing but can body up bigger threes thanks to his frame. -Tools of a two with the game of a three. Average length with a 6'8 wingspan. Borderline thick frame. Mature physically. One of the oldest players in attendance. Will have to continue to keep his conditioning up to keep up with quicker wings on both ends. -Doesn't have much wiggle with the ball. Not going to create a lot of offense. Basic ball handler. Limited to straight line drives. -Not going to play above the rim in the half court. Average leaper. -Willing to play a role, but can get a bit sped up at times when put in shot creation or playmaking situations. Best when he keeps it simple. -Best guarding threes at this stage although he has the height and length of a two. Average twitch. A bit bulky fighting over ball screens. -On the streaky side as a shooter. Needs to be near knockdown given some of his limitations as a primary shot creator. M.J. Walker took a back seat of sorts as one of the less heralded prospect on a loaded USA Select Team. Although Walker didn't stand out in one area or have a major impact in practices or the game, he should be able to step in and contribute early on at the college level (depending on where he ends up) thanks to his mature frame and ready-made shot making. 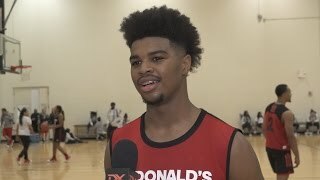 An interview with elite 2017 high school prospect M.J. Walker from the 2017 McDonald's All-American Game in Chicago, Illinois.